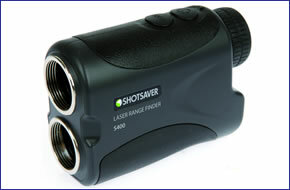 Snooper Shotsaver S400 laser range finder with 'Pole Position' technology uses Hi-accuracy laser technology to provide accurate distances to just about any object around the golf course. Snooper Shotsaver S400 utilises 'Pole Position' technology enabling it to accurately pick out the distance to the flag up to 250yds even when there are larger objects such as trees and bushes in close proximity behind it. Operates on any golf course Worldwide! No PC required, no subscription fees! Instantly calculate distances to any object visible. Up to 250yds to the flag. Up to 400yds to larger object such as bunkers and trees. 6x magnification. Includes CR2 3V Lithium battery and FREE (included) carry case with carabiner. Snooper Shotsaver S400 has been discontinued. The replacement model is the Snooper Shotsaver SLR500. To view the latest range of golf GPS systems click here. Golfers the World over demand the highest quality equipment in their golf bag. Knowing precise distances around the golf course is key to a successful score and with that it mind we have developed the Snooper Shotsaver S400 laser range finder. The Snooper Shotsaver S400 laser range finder with ‘Pole Position’ technology uses Hi-accuracy laser technology to provide accurate distances to just about any object around the golf course. Snooper Shotsaver S400 utilises ‘Pole Position’ technology enabling it to accurately pick out the distance to the flag up to 250yards even when there are larger objects such as trees and bushes in close proximity behind it.